Companies everywhere are evolving and changing so they can better meet customer needs. Agility selling has become a hot topic and crucial learning objective for elite sales organizations. Selling has changed significantly in recent years and continues to evolve rapidly. Speed has become the new currency in almost every business aspect, including sales. Customers want things done faster, want products shipped immediately, and want it in their hands within a few days. Therefore, it’s up to your sales team to know what to do, which means quicker delivery and service. A large majority of customers prefer to handle business digitally. Sales teams must keep up with the pace and demands of their clients. To be more efficient, successful sales teams must focus all of their resources on selling, closing deals faster, and improved productivity. You can’t sell efficiently if you are disorganized. Agility selling translates to improved management of customer data and management skills. In our digital age, sales teams must learn to adapt and learn new technologies that will allow them to provide added value to their prospects and customers. Agility in selling refers to an organization’s ability to optimize the workflow of their sales force. An agile salesforce is comprised of sales reps who can wear many hats. They conduct operations and negotiations with clients on all levels of the sales cycle. Agile sales reps are extremely knowledgeable regarding all aspects of their products and services. Having a knowledge understanding of your product will allow you to consult your prospects in a professional and superior manner. Agility selling allows you to answer specific questions or concerns from customers in a timely manner. Due to advancements in digital technology, sales reps can sell with more precision and efficiency. They can respond faster, through a much larger network of communication tough points and keep a close relationship with the client in multiple dimensions. Customers and sales professionals alike are more informed more than ever. Intelligent digital technology gives us the advantage of making highly informed decisions. Sales professionals can interpret valuable customer data with in-depth analytics to measure customer feedback accurately and timely. Furthermore, sales reps can use technology to adjust marketing strategies and improve customer satisfaction. 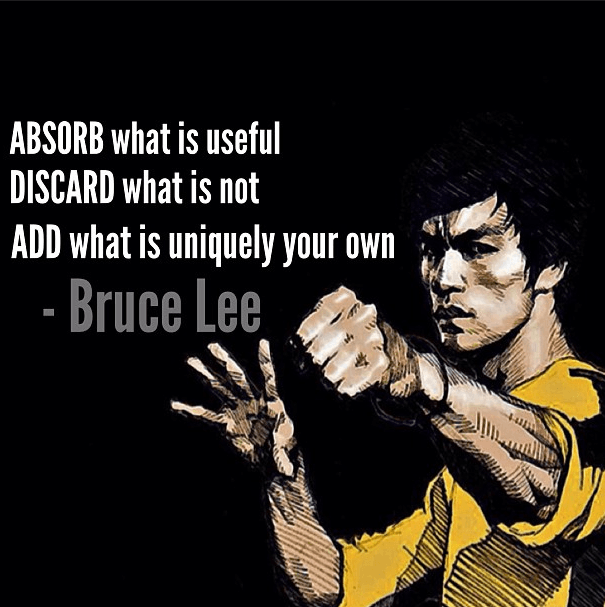 If Bruce Lee was a sales rep, he would be the master of agility selling. If you can’t communicate effectively with your customers to understand their needs and pain points then you can’t respond efficiently. Agile sellers are active listeners. They are able to digest messages from customers to find out their exact needs and wants. Agile sellers choose their language carefully and are flexible with verbal interactions, a crucial attribute when negotiating with customers. Agile sellers are self-aware, humble, and curious. They inspect everything to ensure operations are running like clockwork. In our competitive business landscape, sales teams can not afford to fall behind. 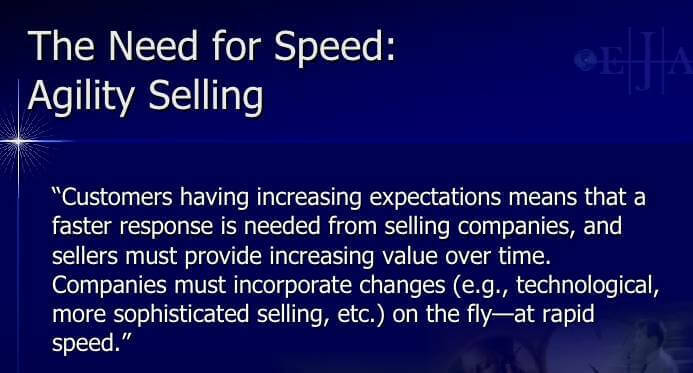 If speed is the new currency in sales than sales professionals must learn to adapt to the new environment. Agility requires being responsive and constantly restructuring sales strategies in order to stay up to date with the persistent changes in the clients’ culture. Elite sales professionals constantly hone their sales skills and integrate them into the latest technology. Sales agility requires flexibility from sales professionals in all matters of selling. Sales professionals who lack fundamental sales skills, product knowledge, a curious mindset, critical thinking skills, and technological competence are limited by their inability to engage customers in meaningful ways. They will fall behind in their race to sales success. sign up for our the Sales Coaching Institute newsletter to learn more!